Welcome to the Mathematics World! This is a fantastic game with numbers. You have to think fast enough to win the game. 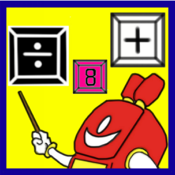 This game helps kids think faster in mathematic. It helps adult think faster too. It is fun and turns you to be a mathematics master ! If you like Tetris, Diamond or Sudoku game, you will like this game.